Paul Mayer married his third wife, Caroline (Lichtenfels) Hammann on 4 Feb 1869, making her my 2nd-great-GM. She was born in Indiana in 1844 to parents John C. Henry and Eva (Baetz) Lichtenfels. 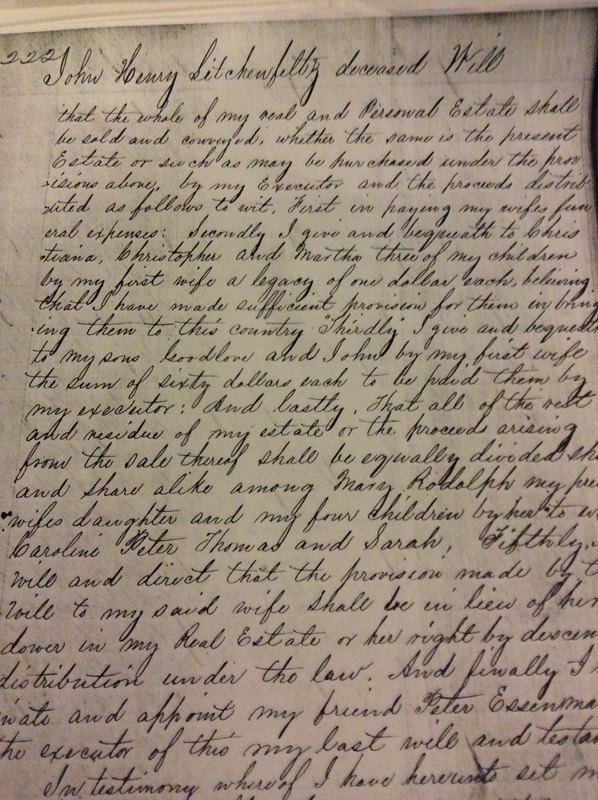 While at the Wayne County Courthouse getting copies of marriage licenses, I happened to check the will book for the year John Henry Lichtenfels died (1853). Lo and behold, there was his will, listing the children from his first marriage and then the children with Eva. He named a daughter Christiana from the first marriage, so I did a census check for her since her given name was a bit unusual. On the 1860 census, I did find a Christiana Lichtenfels, age 55, living with a younger Christiana (married name Goehner)! My first hunch was John Henry divorced his first wife, Christiana, and married Eva. However, I haven’t found neither a divorce record for the first marriage nor a marriage license for the second marriage. It is possible that some of this might’ve happened somewhere in Ohio as John Lichtenfels lived there for a time (some of his children were born there), but I’m not sure where in Ohio at this point. Also, my guess is Christiana Lichtenfels is the mother of Christiana Goehner as the ages and places of birth fit. Birth years taken from census reports. Needless to say, I find the Lichtenfels interesting. A lead I’m following is another Lichtenfels who came to Indiana during the same time period. His name was Conrad, and he was born in 1797 in Germany. He lived in a nearby county and was said to have immigrated with a younger brother. I think that might have been John C. Henry Lichtenfels, but, as yet, I have no proof of that. ETA: On the 1850 census, John Litchenfelts [sic], age 49, is listed as married to Eve, age 39, with children George, age 18 and born in Germany, and Mary, age 12 and born in Ohio, plus Caroline, Peter, and Thomas (all of their ages correct as compared to other censuses and cemetery information). This makes me wonder if George is John and Mary is Martha? If so, the Lichtenfels were in Ohio in 1838 and in Indiana by 1844. So many answers that lead to many more questions!